A lot of early discussions about Netflix’s The Punisher centered around its glorification of guns, which I think is both fair and unfair. It’s fair because gun violence is a major moral crisis of 21st century American life and I think we should be talking about it constantly (The Punisher’s release date was pushed back because of the shooting in Las Vegas, which left 58 dead and at least 527 wounded). 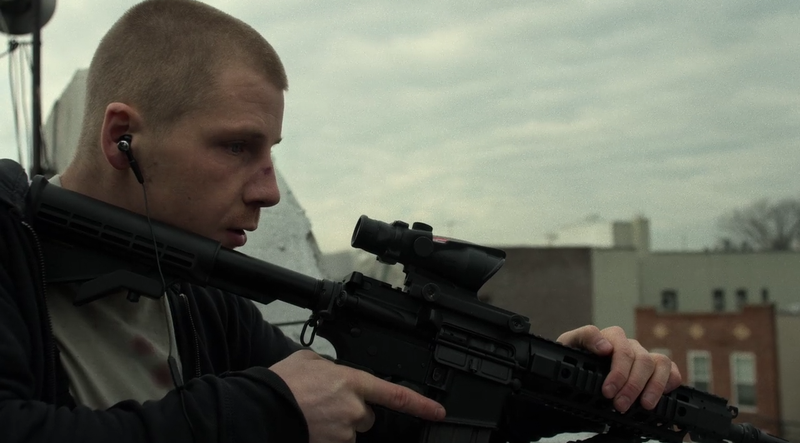 It’s unfair because, well, The Punisher is hardly the only series to star a hero who shoots people. Yet the hand-wringing about Frank Castle doesn’t swirl around other gun-wielding heroes like Deadpool, James Bond, Indiana Jones, or John Wick—at least not to the same extent. And on that level, “Front Toward Enemy” is an abject failure. It wants to critique the idea of vigilante justice but it can’t see Frank as anything but a sympathetic hero. It wants to have a debate about gun control but it can’t get the basics of the conversation right. And worst of all, it wants to score points for bringing up real-world issues without actually engaging with them in a meaningful way. The Punisher may adopt a veneer of intellectualism in this episode, but it doesn’t actually have much to say. Let’s start with the gun control debate, which is easily the clunkiest part of this episode. After Lewis plants some bombs as part of his anti-government, pro-gun agenda, Karen is brought onto the Ricky Langtry’s radio talk show alongside Senator Stan Ori, who is pushing for more gun control laws. But rather than let the characters have an actual debate about the nuances of the issue, the show reduces Karen and Ori’s positions to a simplistic pro- vs. anti-gun debate. The problem is, that’s not actually the debate people are having in the real world. Mainstream politicians aren’t asking to repeal the Second Amendment, they’re asking for common sense gun laws—like banning the kind of assault-style semiautomatic weapons and attachments that allowed the Las Vegas shooter to fire more than 1,100 rounds in less than 11 minutes. Or they’re asking to close loopholes in background checks in order to prevent domestic abusers from purchasing weapons. The show thinks it’s stumbled upon a delicious irony when it has Senator Ori hire Anvil to protect him from retaliation by Lewis, but, once again, disarming trained security guards isn’t what the real-world gun debate is about. And to imply that those pushing for stricter gun control laws are simply smarmy politicians trying to take away everyone’s guns is, frankly, immoral given how frequently that kind of conspiracy thinking is used as a talking point in anti-gun-control propaganda. The Punisher doesn’t need to come down one way or the other on the issue of gun ownership, but to misrepresent the actual debate itself is a huge misstep. There’s also a narrative reason this debate doesn’t work. Like her or hate her, Karen Page is a character we’ve spent a lot of time with and one the show clearly cares about. So her pro-gun position carries with it a certain amount of gravitas. Ori, however, is a brand new character whose position the show is all too eager to undercut during his conversation with Billy Russo. His point of view doesn’t carry the same weight as Karen’s because we don’t know anything about him besides his ideological stance on one issue. Within the world of The Punisher, Karen and Ori’s voices might carry equal weight. But for the show’s audience, they don’t. So what’s the point of watching their debate? That idea also speaks to a larger concern I have about the series: The Punisher has done an excellent job depicting why Frank feels justified in his brand of vigilante justice, but it’s failed to give us a character who challenges his worldview in any meaningful way. Micro and Curtis are openly supportive of Frank’s vigilante ways. Despite her connection to the law, Madani’s been largely sympathetic to Frank’s plight since he saved her from that car wreck. And despite a brief moment in which she warns Frank that he’s not that different from Lewis, it’s pretty clear that Karen is staunchly #TeamPunisher. “We must not tolerate those who use violence to communicate,” Karen writes in her op-ed about Lewis. Apparently that critique doesn’t extend to her old pal Frank. And yet the show does want to examine Frank’s morality. Lewis is explicitly designed as a foil for the Punisher. He’s taken Frank’s vigilante justice to such an extreme degree that it’s become terrorism. He has all of Frank’s fury with none of Frank’s moral code. But as with the issue of gun control, The Punisher shifts the debate to ground it’s more comfortable on. It argues that the downside of Frank’s vigilante justice isn’t that he kills people without a trial, it’s that other people might copy what he’s doing but not do it as well. Instead of asking “why does Frank get to decide what’s right and wrong?” the show is simply saying “gee, it’s bad that other violent vigilantes aren’t as awesome as Frank.” So though Lewis is ostensibly a lens through which to examine Frank’s morality, it winds up feeling like he’s mostly just there to make Frank look more humane by comparison. If I were to ignore the larger implications of this episode and just focus on its plot, action, and character beats, it would be a far more successful outing. The Curtis vs. Lewis showdown is a brutal but compelling fight, and Frank’s escape from the cops has some nice visual flair—even if his slide across the cop car did feel like it came from a different superhero series. And from a pure character point of view, this is an excellent episode for Frank. When it comes to putting his life on the line to a complete a mission, Frank is an unstoppable force. But when it comes to protecting someone he cares about, Frank will give up his single-mindedness at the drop of a hat. That’s what happened in “Cold Steel” when he hastily agreed to approach Madani solely to prevent Micro from revealing himself to Zach. And that’s what happens here when he immediately prioritizes saving Curtis over his original mission of killing Lewis. There’s a great scene in which Frank tells Micro that Karen is his family and he seems to feel the same way about Curtis too. Frank refuses to leave his friend’s side, even if that means getting shot by Lewis, getting caught by the cops, or even getting blown up by a bomb. They’re bonded together as brothers, not only because of their time in service together but also because of the guilt Frank feels for not stopping the suicide bomber who caused Curtis to lose his leg. 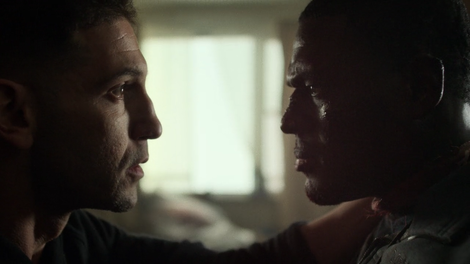 If there’s one thing The Punisher excels at, it’s making Frank a flawed, human, and deeply compelling character. But when it comes to exploring the real-world implications of Frank’s story, The Punisher is more of a mixed bag. It’s largely succeeded at exploring the experiences of soldiers and vets, but it’s largely failed at interrogating the violence inherent in its premise. We’ll just have to wait and see if any of that changes now that Frank’s back to being a wanted man. Elsewhere in the episode, Madani is dealing with PTSD from Stein’s death. She decides to tell the world the truth about Kandahar, but she’s sidelined by Micro, who informs her that he wants to team up. I’m glad the show didn’t end up killing Curtis as that would’ve meant not only killing off the only black character but also killing off the only veteran character who hasn’t turned to a life of violence and/or terrorism. Also Curtis is just awesome. I wish Karen had been on Trish Talk rather than Ricky’s show. How much more interesting would it have been if Lewis had been inspired by the Punisher during his whole arc, not just once he learns Frank is alive? “His name is Lewis and he drives a cab. Could you find him on there?” I enjoy that Frank becomes an old man when it comes to understanding technology. I also like that Micro doesn’t immediately punch some buttons and pull up all of Lewis’ information. There are clearly some hidden cuts and stunt doubles in Frank’s escape scene, but I *think* the one-shot sequence in which he hits a cop with a rock, slides over the hood of a car, beats up another cop, and drives away might actually be Bernthal? If not, it’s seamlessly done. Frank claims he always looks his victims in the eyes when he kills them, which is what separates him from Lewis. Except that isn’t even remotely true. We’ve seen him use a sniper rifle to kill and/or try to kill unsuspecting victims in their homes multiple times.